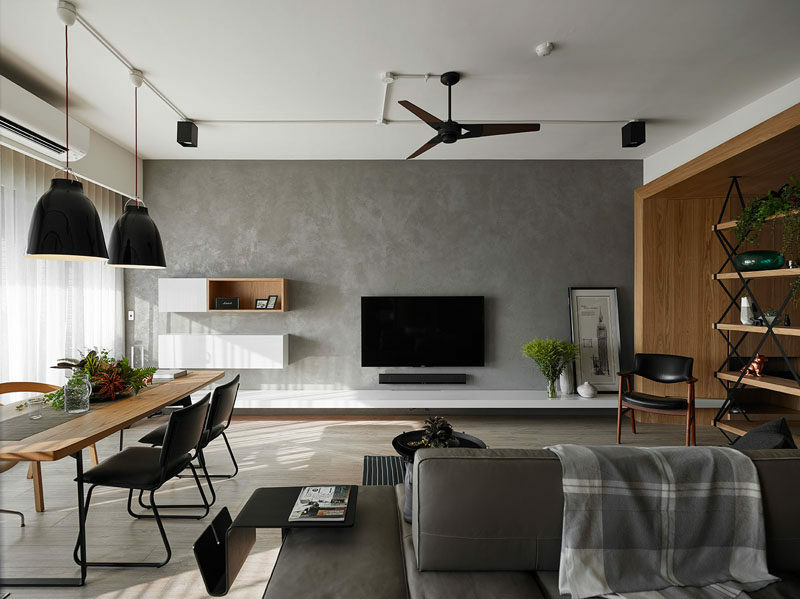 Awork Design Studio have completed the design of this apartment in Taipei, Taiwan for their clients, whose wish was to have a home that would have an open design, allowing them to maximize the space for their children, as well as bring in as much natural light as possible. The home was split up into different zones that all serve different purposes. Upon entering the home, an open shelf room divider creates a mini reception area with built-in storage for shoes and coats. 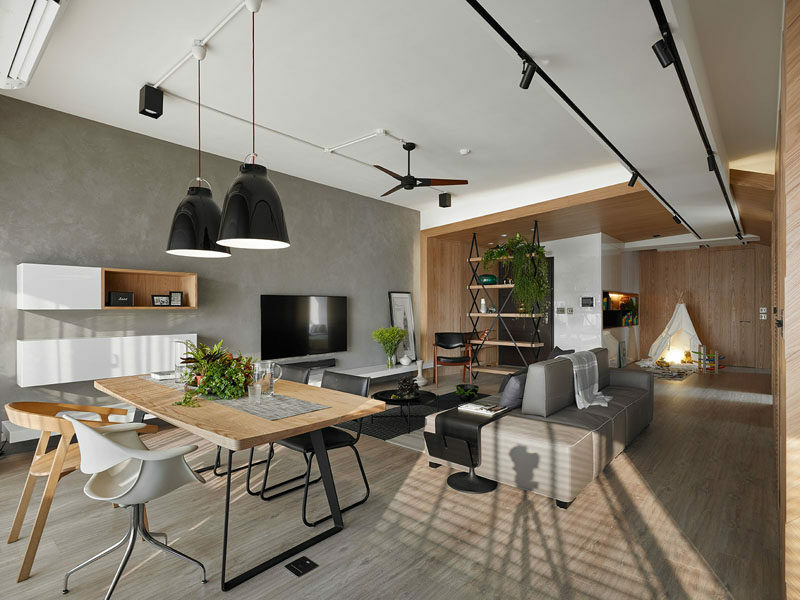 The next zone is the living and dining area. 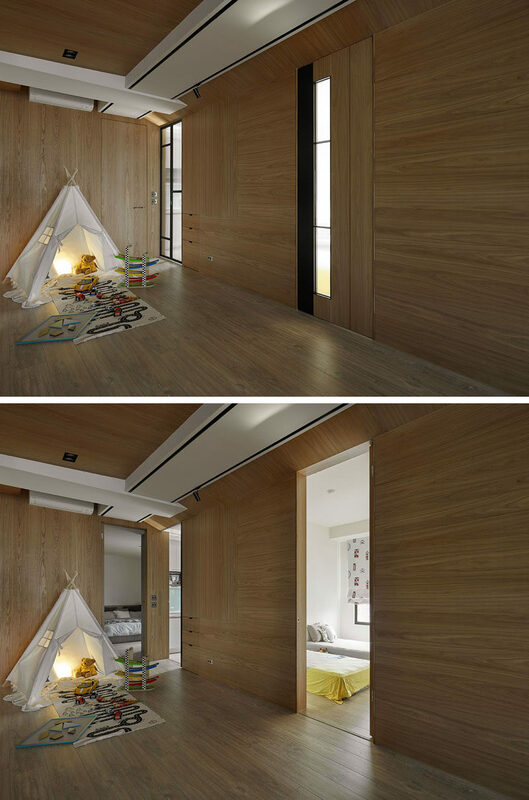 Behind the living area in the wooden wall, there’s a hidden walk-in closet and a bathroom. 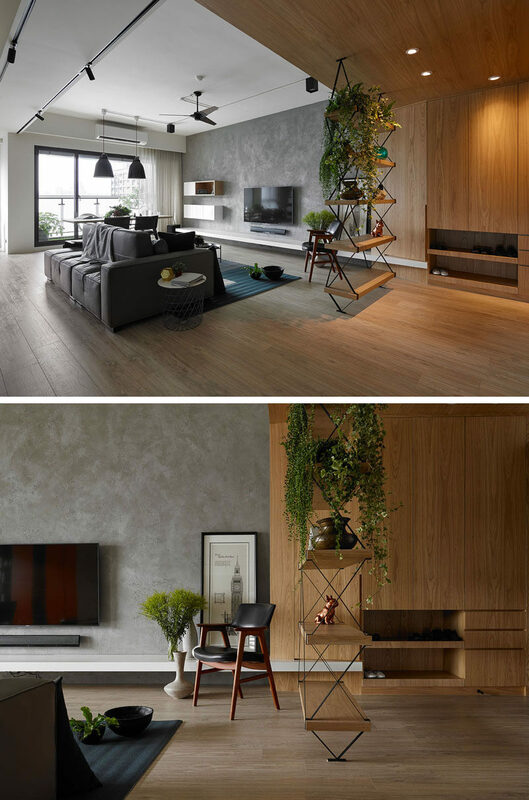 A grey feature wall is home to the television and additional floating storage. The dining room has been positioned next to the window and small balcony, taking advantage of the light. This zone is the study area. 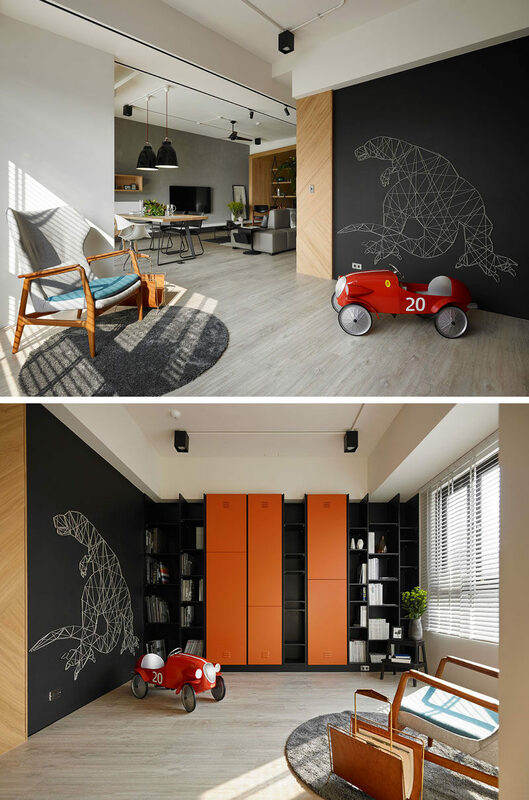 A large string art dinosaur adds a fun element to the space, and a wall of shelving makes sure there’s plenty of room for books, magazines, and decorative items. 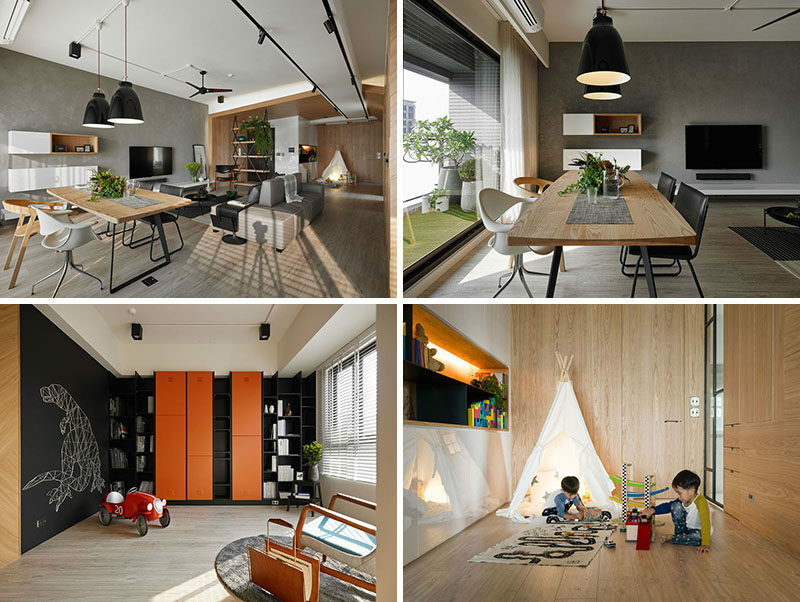 Back in the main living area, and tucked around the corner, is the play zone for the children. There’s a built-in storage unit and open shelving. Off to the side of the play area, there are somewhat hidden doors that when open reveal the master bedroom on the left, the kitchen in the middle, and the children’s bedroom on the right. 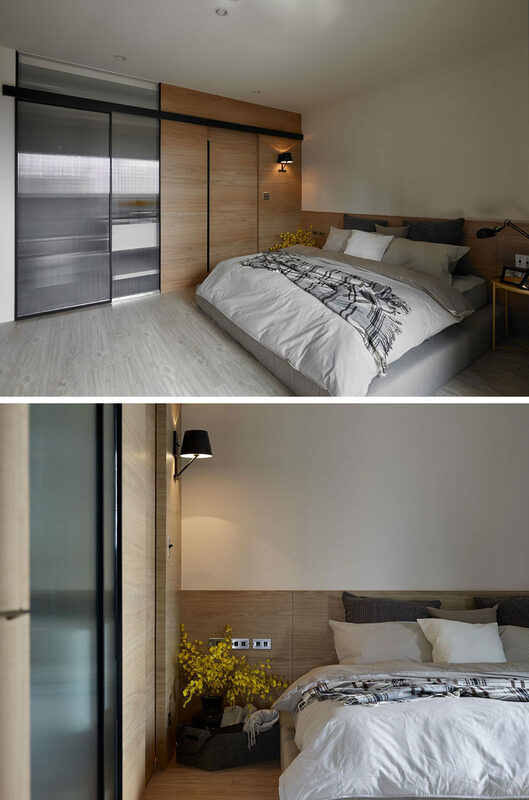 Throughout the apartment wood has been used to create a sense of warmth, like with the headboard and door to the walk-in closet. The master bedroom also has an ensuite bathroom with a walk-in shower.